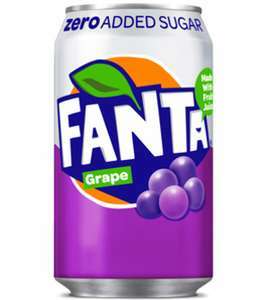 Fanta Grape (Zero added sugar) 330ml x 24 can pack, 3 packs for £18 at Farmfoods Normanton WF6 but maybe nationwide. Tried this a few weeks ago. Not too bad. I wanted it to be like the fizzy Welch’s grape they sell in America but wasn’t as good. Probably the zero sugar! Not as good as the full fat version you get in the states. They sell a bottle in Asda pretty cheap. I’d try that before committing to this. It doesn’t take like you remember. They sell a bottle in Asda pretty cheap. I’d try that before committing to …They sell a bottle in Asda pretty cheap. I’d try that before committing to this. It doesn’t take like you remember. Sugar free so guilt free ? Shame all the flavour and enjoyment is gone without the sugar now! Even Old Jamaica Grape Soda tastes naff now! Jamie Oliver deserves a good kicking! Tried this a few weeks ago. Not too bad. I wanted it to be like the fizzy …Tried this a few weeks ago. Not too bad. I wanted it to be like the fizzy Welch’s grape they sell in America but wasn’t as good. Probably the zero sugar! 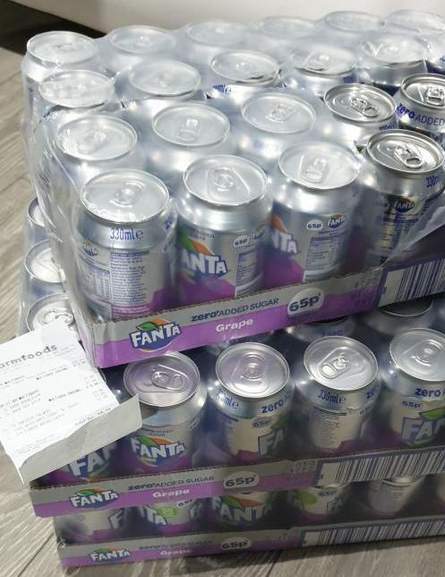 It is the zero sugar... Amsterdam sell this and blackcurrant, they are worth losing your teeth for. Guilt free? It will probably cost the nhs a lot more down the line. This is probably the worst drink in the Fanta Range, weird taste to it. They’ve got 7up , Pepsi, Fanta and Vimto in the same offer. I don't buy sugar free drinks....taste terrible. Aside from the taste, natural sugar breaks down and exits your body. These artificial sweeteners do not break down the same way and your body harbours their residue for years....then the results and damage will show. Don't fall for the narrative of them being healthy.